Christian tradition holds that Jesus died at three o’clock in the afternoon. The Three O’ Clock Prayer is a prayer based on that belief and focuses on the final moments of Jesus’ life when he entrusted the care of his mother Mary to his beloved disciple. Blessed William Joseph Chaminade believed that when he proclaimed to John that from this time forward Mary would be his mother, Jesus entrusted the Church into the care of his mother. The Marianists adopted that prayer as a means of uniting the Marianists around the world in an act of prayer and solidarity. Students in Marianist schools pray this prayer at the end of the school day as a way to join in this tradition. with your Mother and the disciple whom you loved. We ask your pardon for our sins which are the cause of your death. and for giving us Mary as our Mother. and open us to the action of the Holy Spirit. Mary into our life, as you did, and of assisting her in her mission. be glorified in all places through the Immaculate Virgin Mary. Saint Mark tells us today that when Jesus crosses in a boat to the other side of the Sea of Galilee, a great crowd gathers around him because rumors are flying about the Amazing Jesus-Man. Imagine the buzz in the crowd: One person says that she saw Jesus remove an unclean spirit from a man, leaving everyone amazed and saying, "What is this? A new teaching -- with authority!" Another says he watched Jesus heal a paralytic and reports that all who witnessed it were amazed and glorified God, saying, "We have never seen anything like this!" A third tells of how a demoniac was healed by Jesus, and then the man "went away and began to proclaim how much Jesus had done for him; and everyone was amazed." Again and again, Saint Mark reports that people are amazed. The Amazing Jesus-Man. All of Jesus' mighty acts are intended to save them. Whether they're facing evil, illness, destruction or death, Jesus wants to come to the rescue. In fact, the Greek word for "save" pops up again and again in the gospel of Mark, although it's usually reduced to bland English words such as "heal," "cure" or "get well." What amazes the crowds is that Jesus is working to rescue them, to save them. First to appear is Jairus, one of the leaders of the synagogue. Although you might think that he would be in league with the authorities who are anxious to stamp out the "Jesus menace," Jairus is desperate. He falls at Jesus' feet and begs him repeatedly, "My little daughter is at the point of death. Come and lay your hands on her, so that she may be made well, and live." What the Greek actually says is that Jairus wants Jesus to lay hands on her, "so that she may be saved, and live." Jesus goes with Jairus, and a large crowd follows him and presses in on him. And just as you think, one challenge is never enough -- he goes to save one person and is unexpectedly pulled aside to save another. A woman who has been suffering hemorrhages for 12 years comes up behind Jesus in the crowd and touches his cloak, believing, "If I but touch his clothes, I will be made well." She says to herself, "If I but touch his clothes, I will be saved." The woman reaches out, touches Jesus, and immediately her bleeding stops. She is healed of her disease and rescued from a miserable life of pain, social isolation and exploitation. Jesus saves. But wait. Jesus has a feeling that his power has flowed out of him. Jesus spins around in the crowd and says, "Who touched my clothes?" His disciples look at him as though he's crazy, since a mob of people are pressing in on him from every side. But Jesus searches the crowd for the person he knows is out there, until the woman finally confesses what she's done. He doesn't rebuke her, but instead says, "Daughter, your faith has made you well." Sort of. What he really says is, "Daughter, your faith has saved you." Time to look at the Sacred Scriptures for this weekend, the 13th Sunday in Ordinary Time. You'll find the texts and background material on them here. The second reading, from II Corinthians, contains a number of parallelisms which add a finer literary flair than Paul usually offers us and includes this mysterious verse, almost a riddle: Whoever had much did not have more and whoever had little did not have less. And our Gospel is a complex text. It is the story of Jesus raising Jairus' daughter from the dead and includes an account of a second healing Jesus performed on the way to Jairus' house. But how to discern the true preachers of the Gospel from the false ones? Pope Francis said there are three things to look for: how do they speak, what do they do and, do they listen? 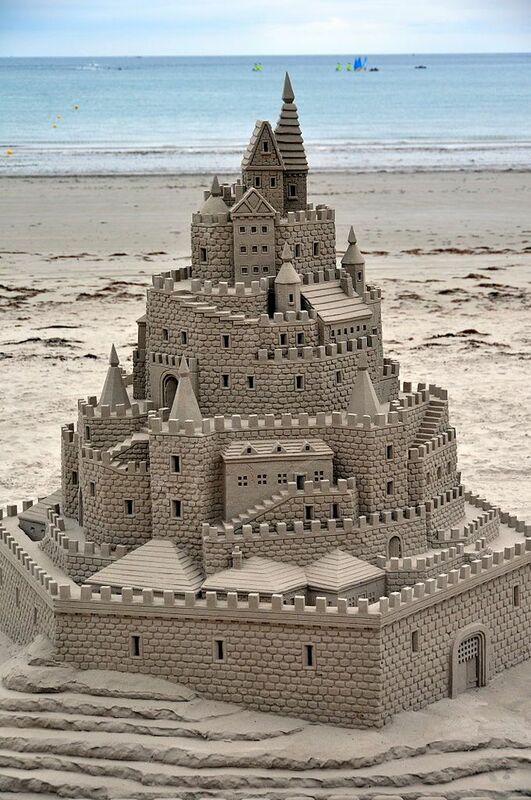 In the last half of today’s Gospel, Jesus tells his disciples that hearing and acting on the word of God is like building a house on rock while hearing and not acting on his word is like building a house on sand. This can be applied to so many areas in our own lives. And all of these areas need a strong foundation in faith and a willingness to act on that faith to survive all the storms that will inevitably come. Belief in God and his support provides purpose and strength for the efforts required for successful relationships. Finding God in another provides the motive and ability to love them when they are not at their best and to put the other ahead of self. Trust in God’s unwavering love provides the ability to share and survive the pains and losses that come to every human relationship. Even friendships that are centered on God are not perfect because we are not perfect, but they are more likely to weather the trials and pains that come their way. It’s just about six months until Christmas! But for a preview of coming attractions, and a glance ahead to Christmas, look no further than the feast we celebrate tomorrow, the nativity of John the Baptist. Even now, in the blazing light of June, just past the summer solstice, when the days are longest and we’re lathering on the SPF 40 sunscreen…our attention is being drawn to a distant star of winter. Because today, we meet another miraculous infant: the one who will grow up to prepare the way of the Lord. This is a phenomenal feast – and a rare one. Only three times during the year does the Church celebrate a birthday: for Jesus, for His mother…and for John the Baptist. The Baptist is in illustrious company, and this serves to remind us just how important he is to our salvation history. When you consider the circumstances surrounding it, the Nativity of John the Baptist is almost as full of wonder as the nativity of Jesus. Like Jesus’s birth, there is great mystery. There was an angel who announced it, and parents who hadn’t planned on it, and a name for the baby that was chosen by God. In one of the more remarkable moments of this Gospel, Elizabeth defied family tradition with one succinct phrase: “He will be called John.” She was able to make that leap of faith and give this child the name for which he was destined. John is an ancient Hebrew name rich with meaning – for Zechariah and Elizabeth. And for us. In giving an aging, childless couple a new life…God is gracious. In making what seemed impossible possible…God is gracious. In working miracles where we least expect…God is gracious. He is gracious in offering us that most precious and elusive commodity: hope. And so it was that before this child has uttered a word John, just with his name, announced the hope that would come with the Christ. Despite our hardships and misgivings, our problems and setbacks…God is gracious. And His grace is what sustains us. The birth of John the Baptist is the pivot around which our calendar turns – just as his life was the fulcrum for our faith. He was the last prophet of the Old Covenant – and the first prophet of the New. He is the doorway through which humanity was able to enter the Christian era. He opened the world’s ears – and eyes – to possibility. He made us ready for Christ. Consider that. Consider what that has meant for us, and how the forerunner of the Messiah was also the forerunner of all that we do here this day. He prepared the way of the Lord. And he prepared the way for all that would follow – including this Holy Sacrifice that we celebrate today. Beyond being a prophet, and a martyr, and a saint, John the Baptist was one of God’s gifts to a needy and searching world – a sign to us of a Father’s generous love for His children. A cause for optimism and a reason for hope. You could almost consider this feast the Christmas BEFORE Christmas. And it comes to us as a blessed reminder of what God can do. Elizabeth, the Baptist’s mother, put it so clearly and so perfectly, as mothers often do. 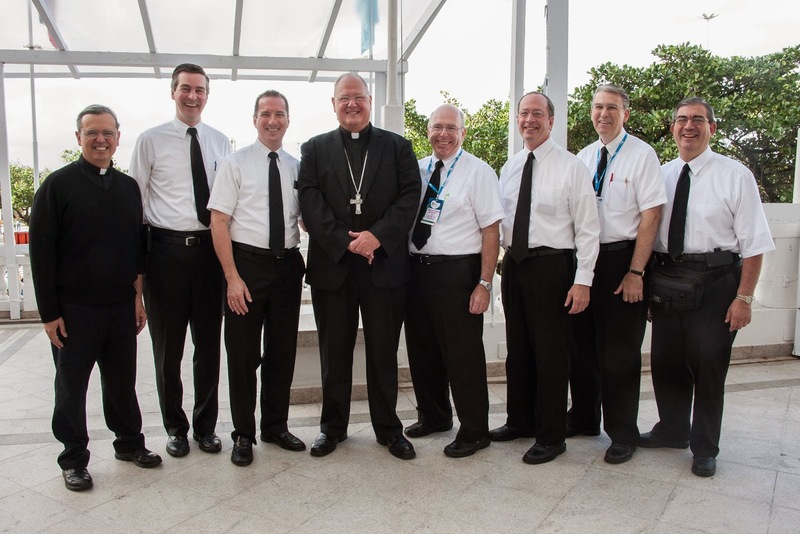 The prayer of Marianist communities flows from an understanding of being formed by Mary to be Christ. Marianist prayer attempts to make God’s word the energy and conviction that guides our feelings and choices. We ponder the mysteries of Jesus’ life as presented in the Scriptures; we are moved by an insight or feeling; we express that insight or feeling in a personal prayer of gratitude, conviction, or petition; we examine in our conversation with God how our day-to-day behavior reflects (or does not reflect) the attitude of Jesus about which we are praying. And finally, we offer thanks to God for this treasured time of prayer and commend our lives to God and Mary. Sounds simple, but it takes a lifetime! I just stumbled across this terrific meditation on God as Father, written by Marcellino D’Ambrosio. Most of the great religions of the world believe in one God and teach the gist of the Ten Commandments. But that the supreme Being is not just “King of the Universe” or “Master” but “Father,” that he desires that we have a close, familiar relationship with Him–these ideas you don’t find anywhere outside the teaching of Jesus. To call God “Father” does not mean to say, of course, that he is an old man with a white beard. Only the second person of the Blessed Trinity wedded himself to a male human nature in the womb of Mary. The Father and the Holy Spirit are pure Spirit and transcend male and female, masculine and feminine (CCC 239). This is no new insight brought to Christianity by the feminist movement. It has always been taught that the word “Father” applied to God, is used by way of analogy. Analogies tell us something very true despite being imperfect. Until recently, the father was recognized by Western society as origin, head and provider of the family. To call the first person of the Trinity “Father” means that he is the origin and transcendent authority of all and cares for the needs of all. But we all instinctively know that a father who just pays the bills and barks orders is not enough. We expect a dad to have an intimate, affectionate relationship with his children, to spend “quality time” with them. To call God “Father” means, then, that he is near to us, intimately concerned with us, fond of us, even crazy about us. He is not the distant, clockmaker God of Thomas Jefferson and the Deists. This aloof God of the philosophers created the world to run by virtue of its own natural laws so that he could withdraw and occupy himself with more interesting pursuits. No, the God whom Jesus calls Father cares about us and knows us intimately. “Every hair on your head is numbered (Mat 10:30).” He loves us more than we love ourselves and knows us better than we know ourselves. That is something we often forget, and something, I think, that we need to hear, now more than ever. Pope Francis is calling for an “ecological conversion” for the faithful in his sweeping new encyclical on the environment. 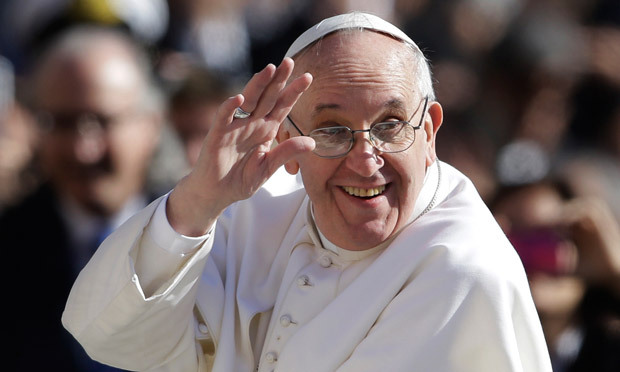 In “Laudato Si,” or “Be Praised” (or “Praised Be,”) he warns of harming birds and industrial waste and calls for renewable fuel subsidies and energy efficiency. Here are 10 key ideas people will read closely, everything from climate change and global warming to abortion and population control. 1) Climate change has grave implications. “Each year sees the disappearance of thousands of plant and animal species which we will never know, which our children will never see, because they have been lost forever,” he writes. 9) Individuals must act. “An integral ecology is also made up of simple daily gestures which break with the logic of violence, exploitation and selfishness,” he writes. We should also consider taking public transit, car-pooling, planting trees, turning off the lights and recycling. 10) By the way, why are we here on Earth in the first place? “What kind of world do we want to leave to those who come after us, to children who are now growing up?” he writes. “Take care not to perform righteous deeds in order that people may see them; otherwise, you will have no recompense from your heavenly Father." Hmmm this is interesting, Jesus has been telling us how we ought to live - how we ought to practice our righteousness. And now Jesus is not telling us not to practice our righteousness. Now what Jesus is now telling us, is who we should be practicing our righteousness for, and who we shouldn’t. Jesus wants to warn us against doing righteous looking things in front of other people in order to impress them. And in Jesus’ day there were lots of people who did that. Remember Jesus told us that our righteousness needed to exceed that of the Scribes and Pharisees. Now the Scribes and the Pharisees were the spiritual gurus of the day. They wanted everyone else to know how righteous they were. How holy, how good, how close to God they were. They did this because they wanted others to think they were pretty good. They were only concerned with how they looked to others, so they concentrated on the externals, not the internals, and we’ve seen how Jesus is not just interested in the externals as He is with what goes on inside. And as Jesus says, if we do good things just so other people will think we are spiritual or holy or religious, then we’ve already received our reward from those people, and so we won’t get any reward from God our Father. Jesus then uses three ways that the people of His day tried to look righteous before others: giving to the needy, prayer, and fasting. And the structure of each one is very similar. In each case, Jesus gives an example of how we can do righteous deeds, but do them only to win the favor of other people. And if we do them for that reason, then we receive our reward from those people, and won’t be rewarded by our Father. Saint Mark's Gospel tells us that Jesus chose to speak in parables. Some people find that very annoying, and even a bit dishonest. Why didn't Jesus come right out and say what he meant? Why did he leave behind all these cryptic sayings, loaded with innuendo, instead of a crisp code of laws or a stack of essays with titles like "How to Be a Good Disciple," "A Brief Definition of the Kingdom of God" or "Seven Key Features of the Coming Kingdom and What This Means to You." But no. Instead we have this cross-eyed, cryptic, incomplete, awkward, and at times seemingly absurd collection of sayings known as Jesus' parables. All of us are in the process of writing our own gospels -- our own accounts of experiencing the Good News of the coming kingdom in our midst. Writing a gospel through the very act of living is part of being a disciple of Christ. 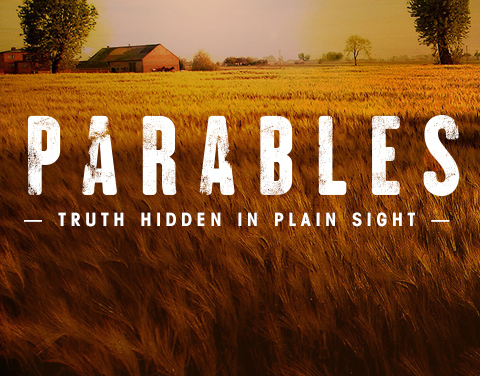 It is why Jesus gave the power of the parable to all those listening to his words. Storytelling is one of the most basic practices common to all human communities. Stories connect us to one another, to our ancestors, to our world and to our God. In today's Gospel text, Saint Mark notes that when Jesus spoke to the crowds around him, he "spoke the word to them, as they were able to hear it; he did not speak to them except in parables." Jesus knew that only parable power had the ability to make the Good News of the kingdom a potent reality for every listening ear. In celebrating Mary’s immaculate heart today, we celebrate her single-heartedness. Sin divides our heart between self and God, making us no longer single-hearted, no longer immaculate of heart. But, as with any other time when we honor Mary, we run the risk of making her distant and inimitable, precisely as we mean to exalt her: congratulations, Mary, but we are not in the same league. So today I want to bring up another dimension of Mary’s heart, a dimension that helps us realize that she is very much in our league, a dimension that is hinted at the end of today’s Gospel reading, namely, her pondering heart: his mother kept all these things in her heart. Mary faced a number of situations she did not understand. We are told explicitly this much at the Nativity and in the episode narrated in today’s Gospel reading. Implicitly we are told the same when she hears Simeon’s prediction, when her Son appears to be telling her at the Cana wedding this is none of our business, when she hears Jesus say who is my mother?, and most of all at the foot of the cross. But Mary kept moving on without understanding, pondering in her heart. Her steadfastness, her single-heartedness was not based on external evidence, but on trust. Her pondering in her heart without understanding had helped her to move from not understanding to not needing to understand –how could a mother understand that her innocent Son is being cruelly executed? Being sure and being assured are not the same thing. Being sure speaks of understanding, which rests on evidence. Being assured speaks of an inner stance, which rests on trust. Mary was assured, even when she could not be sure. 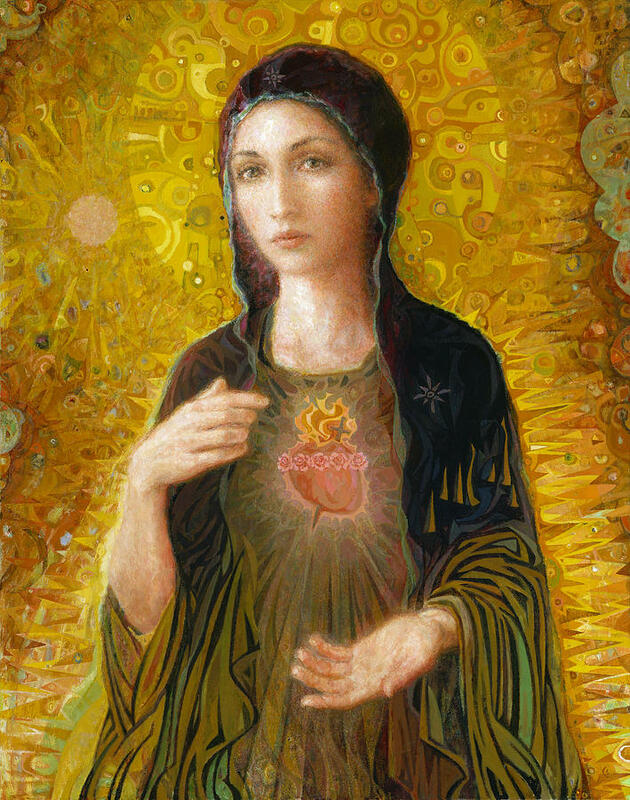 Mary was steeped in a trust born of her pondering heart, her immaculate undivided heart. V. God the Father of Heaven, have mercy on us. Heart of Jesus, formed by the Holy Spirit in the Virgin Mother’s womb. Heart of Jesus, substantially united to the Word of God. Heart of Jesus, of infinite majesty. Heart of Jesus, holy temple of God. Heart of Jesus, tabernacle of the Most High. Heart of Jesus, house of God and gate of heaven. Heart of Jesus, glowing furnace of charity. Heart of Jesus, vessel of justice and love. Heart of Jesus, abyss of all virtues. Heart of Jesus, most worthy of all praise. Heart of Jesus, King and center of all hearts. Heart of Jesus, in whom are all the treasures of wisdom and knowledge. Heart of Jesus, in whom dwells all the fullness of the Godhead. Heart of Jesus, in whom the Father was well pleased. Heart of Jesus, of whose fullness we have all received. Heart of Jesus, desire of the everlasting hills. Heart of Jesus, patient and rich in mercy. Heart of Jesus, rich to all who call upon You. Heart of Jesus, fount of life and holiness. Heart of Jesus, propitiation for our offenses. Heart of Jesus, overwhelmed with reproaches. Heart of Jesus, bruised for our iniquities. Heart of Jesus, obedient even unto death. Heart of Jesus, pierced with a lance.Heart of Jesus, source of all consolation. Heart of Jesus, our life and resurrection. Heart of Jesus, victim for our sins. Heart of Jesus, salvation of those who hope in You. Heart of Jesus, hope of those who die in You. Heart of Jesus, delight of all saints. V. Lamb of God, who takes away the sins of the world, R. spare us, O Lord. V. Lamb of God, who takes away the sins of the world, R. graciously hear us, O Lord. V. Lamb of God, who takes away the sins of the world, R. have mercy on us. V. Jesus, meek and humble of Heart, R. Make our hearts like Yours. Your Son, who lives and reigns with You forever and ever. Amen. 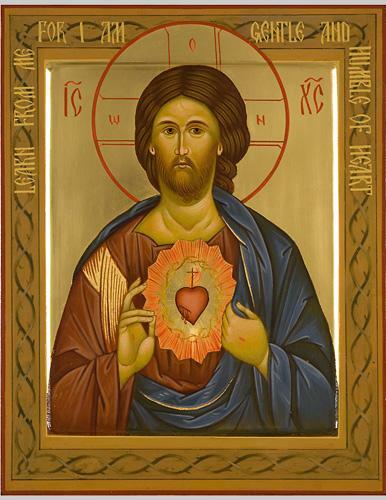 For the coming feast of the Sacred Heart tomorrow, let us reflect on a stirring homily, delivered by James Douglas Conley, the auxiliary for Denver, whose episcopal ordination took place on this day. I have chosen for my episcopal motto “Cor ad cor loquitur” (heart speaks to heart). This isn’t an original quotation. I stole it from my mentor, the Venerable John Henry Cardinal Newman, the great 19th century English convert to the Catholic faith. My first encounter with Newman was during my sophomore year in college when I had to write an essay on an English prose writer, and I chose Newman. It wasn’t even a religious essay. My mom typed the paper for me. I’m not sure she remembers that. But it began for me a life-long love affair with Newman that continues to this day. In fact, tomorrow, May 30, will mark the 161st anniversary of Newman’s ordination to the priesthood which took place in Rome on May 30, 1847. For me, this is another sign of Newman’s influence in my life. But that line, “heart speaks to heart”, was not even original to Newman. He borrowed it for his motto when he was named a cardinal in 1879, from a letter written by the great 17th century spiritual writer and Bishop of Geneva, Saint Francis de Sales. These words “heart speaks to heart” can first be understood as the Sacred Heart of Jesus, the Heart of God, speaking to our heart, calling us to holiness, leading and guiding us to the Father. But “heart speaks to heart” can also describe a type of pastoral charity where an individual leads another individual to God, through love and kindness. One heart at a time, person to person, heart to heart. Newman believed that, next to the power of supernatural grace, the greatest influence over the human soul is the example of goodness in another person. We might think of the people in our own lives who have shaped us the most. Perhaps our parents, a teacher, a priest, a good friend, someone we wanted to emulate. This happens every day. It is through friendship that we are moved to rise above our own weakness, our own vanity and pride, to embrace holiness and virtue, to strive for goodness, truth and beauty. I think we have all experienced this in our lives. And ultimately, it is the example of love and virtue in Jesus, the friendship of the soul with Christ, that draws us to want to lay down our lives for our beloved, to do great things, to love in a heroic way. Pope Francis has said it before - that we are in a sort of piecemeal third world war. The atmosphere is ripe for it. It's undeclared - but we hear of all the conflicts, the mass killings - and we know it is happening - it is indeed an atmosphere of war. Mary, teach me to pray as your taught your child Jesus, and show me God’s glory in ordinary things. Remind me that nothing need escape the embrace of God’s love, no matter how trivial or dreary. As the Holy Spirit transformed your simple everyday duties, making them bright threads in the tapestry he was weaving in your life, pray that he do the same for me. I want to do ordinary things with extraordinary love. Amen. Walter Ciszek was the son of Polish immigrants, born in a coal-mining town in Pennsylvania in 1904. He had a rough child hood – and was even a member in a gang. So his family was shocked when he announced that he wanted to become a priest. Young Walter ended up joining the Jesuits, and went to the Soviet Union to serve as a missionary. For a while, he worked as a logger, ministering to people privately, trying to avoid arrest. But in 1941, he was arrested and charged, falsely, with working as a spy for the Vatican. He spent the next 23 years in prison – sometimes in solitary confinement, sometimes in a gulag, at times doing hard labor. Despite that, he found ways to celebrate mass – often at tremendous risk. Years later, Fr. Ciszek wrote about it. He described in painstaking detail how the prisoners would observe the Eucharistic fast, often going without breakfast, working all morning on an empty stomach, so they could receive communion. A priest would gather them in an assigned spot – everybody, even the priest, wearing rumpled work clothes. And there he would take a small piece of bread and a few drops of wine and transform them into the body and blood of Christ. We aren’t. None of us is. And yet we pray to be made worthy, drawn to this sacrament by love, and by hunger. A hunger for the bread of life. A hunger to take God into our hands, and bring Him into our hearts. And we are drawn as well by the desire to live out those six words that have changed the world – and that will change each of us, if only we let them. Look at the host, and you look at Christ. This Sunday we celebrate the feast of Corpus Christi. 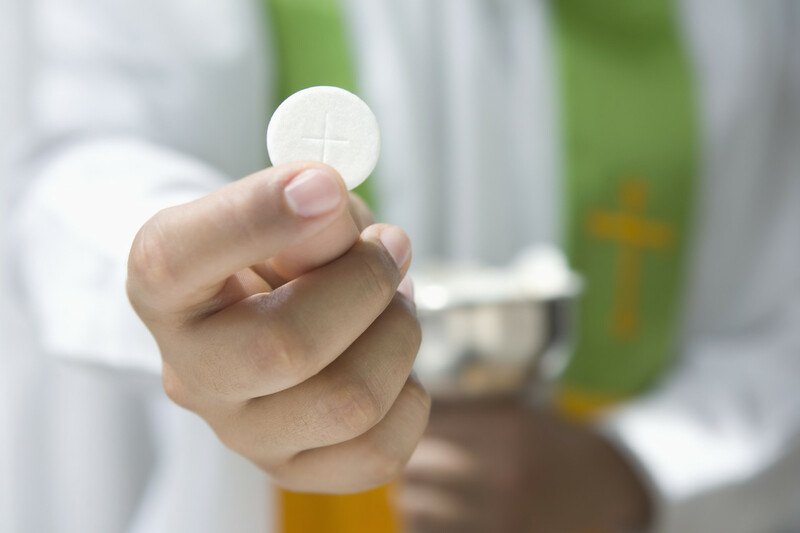 One of the Fathers of the Church described how the first Christians received communion. They did it the way we do it today, offering their outstretched hands, one over another. And he offered this instruction: “Make of your hands a throne,” he wrote. Make yourselves ready to receive a king. Do we understand that today? I’m not so sure. We are receiving an incalculable gift. We are taking into our hands, and placing on our tongues, something astounding. We are being given God. Too often, we take it for granted. It’s just one more part of the Mass. Something else to do. Everything we are, everything we believe, everything we celebrate around the altar comes down to that incredible truth. What began two thousand years ago in an upper room continues at altars all around the world. The very source of our salvation is transformed into something you can hold in the palm of your hand. Just think what we become when we receive the body of Christ. We become nothing less than living tabernacles. God dwells within us. As the hymn tells us, we become what we receive. And what we receive becomes us. 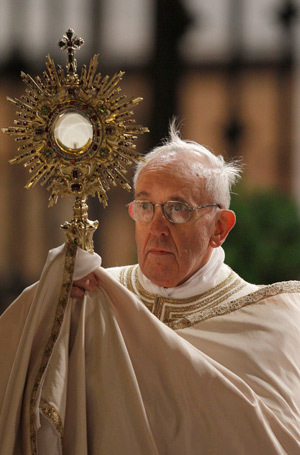 That is the great mystery, and great grace, the great gift of this most blessed sacrament. My question on this feast: what will we do with that knowledge? Once we have been transformed, by bread that has been transformed, how can we leave a holy place without seeking to transform the world? We carry something greater than ourselves. And that makes us instruments of God’s great work in the world – literally. In some small way, we have been changed. When we receive communion we become instruments of Christ, bearers of Christ. “And He showed me that it was His great desire of being loved by men and of withdrawing them from the path of ruin into which Satan hurls such crowds of them, that made Him form the design of manifesting His Heart to men, with all the treasures of love, of mercy, of grace, of sanctification and salvation which it contains, in order that those who desire to render Him and procure for Him all the honor and love possible, might themselves be abundantly enriched with those divine treasures of which this Heart is the source. He should be honored under the figure of this Heart of flesh, and its image should be exposed…He promised me that wherever this image should be exposed with a view to showing it special honor, He would pour forth His blessings and graces. With that, he touches on something that I think is even more beautiful: “our participation in the mystery of the mass.” Central to that mystery is prayer. So, consider how we pray. During the mass, whenever we pray together, we stand. We do it at the beginning of mass, for the opening prayer, and for the “Gloria.” In a few moments, we will stand to pray together the Creed and the Prayer of the Faithful. We will stand for the “Holy Holy Holy” and the “Our Father.” And we will stand for the Prayer After Communion. More often than not, when the priest says those three words – “Let us pray” – we stand. So it seems to me it is only fitting that we stand, too, for the most important prayer we say in the mass, that instant when we receive Christ in the Eucharist. Receiving the Eucharist is a form of prayer. It is a testament of faith, a song of praise. It is a call, and a response. And it is also an affirmation of everything we hold to be true. We are shown the host and the minister of communion says “The Body of Christ.” It’s not “Do you want one?” Or even “Are you worthy?” It is simple and direct: “The Body of Christ.” In other words: behold what is tangible. Real. Present. He is here. And we respond with one small word – a word that sounds almost like a whisper, but that echoes like thunder. Yes. I believe. Yes, I accept the Body of Christ – broken and beautiful and present in the appearance of this fractured piece of bread. Yes, I want Him to become a part of me. Yes, I hold this mystery in the palm of my hand and hold it, as well, in my heart. Yes, I will carry Him with me, in me, into the world. That is what we say with every “Amen” at every communion. Yes. One small word. But how much power is in that word! It is the word that a simple peasant girl uttered 2,000 years ago, when she was also asked to accept the Body of Christ into her own life, into her own body. “Yes,” she said. And with that, Mary became the very first tabernacle. And like Mary, in a similar way, each of us at every mass also becomes a tabernacle. It happens every time we say “Yes” to that sliver of bread, the Body of Christ. We do that, and we carry Christ. He becomes a part of us. We become a part of him. It is a moment that is nothing less than monumental. And saying “Yes” to all that is the greatest prayer we can make. On this coming feast of the Body and Blood of Christ, Corpus Christi on Sunday, let us strive to say that prayer, that “Amen,” as if it is the first time we’ve ever said it. When you consider all that it means, all that it contains, all that we believe in all its mystery and wonder and awe…that is something to stand for. And: to stand up for. to what you say to us in the Gospel. for the harvest of the Church. calmly, in silence, savoring your Presence. We offer you our vocation. Thank you for your call. We know that you listen to us. We are here because you call us. and to give us the gift of new vocations. The English poet T.S. Eliot, in his signature modernist poem The Waste Land, famously claims that “April is the cruelest month.” But personally, I think May and June have April beat by a long shot. You see, May and June are months of departure. I am writing this letter on a Saturday morning in May, the third Saturday of the month, when many of you are graduating from college. In three weeks, over nine-hundred young men and women will graduate from Long island’s three Marianist schools – Chaminade, Kellenberg Memorial, and St. Martin de Porres. The best of intentions notwithstanding, graduation means that we will see many of the people who became some of our closest friends a lot less than we would like. May and June give us plenty of moments to celebrate, but they also bring a series of bittersweet good-byes that tug at our hearts. These transitional days of springtime into summer, from the halls of high school to the campuses of college, and from the world of college to the world of work, are marked by two great feasts of God’s enduring presence. Well, just what are we waking the world up to? I’d like to suggest that we are waking up the world to the gift of God’s enduring presence, to the truth of communion, and to the lived reality that you and I are not alone. And how do we do this? By living in Community and by sharing the fruits of Community with everyone we meet. Community life, family spirit, God’s enduring presence among us – these are at the heart of so many religious congregations. And I know from personal experience that Community life, family spirit, and God’s enduring presence are certainly at the heart of the Society of Mary. For some reason, that song affected me profoundly. It got me thinking about the kinds of loneliness and loss that I see day in and day out. I think of the kid who’s really working hard in my class but just barely passing. Or the guy with the 99 average whose constant quest for the highest grades leaves him perpetually uptight and nervous, anxious and upset. (I was that kid.) Or the last guy to get cut from a team, or the athlete who seems to spend most of his time warming the bench, and it’s really got him bumbed out. Or maybe the last one to be picked for a team in gym class. (I was that kid too.) None of these people are alone. The young adult who’s struggling to maintain his purity. Or anyone reading this letter right now who carries the heavy burden of sin and cannot forgive himself or herself for it. Maybe we’re battling depression, or alcoholism, or substance abuse. Perhaps a loved one is. Maybe you just received your college diploma, but you’re still having a hard time securing a job. Maybe you face a mountain of college debt. At times like these, I know that we think we’re alone. But we’re not. Perhaps someone reading this letter is the young man who has lost a parent. The spouse who has lost a husband or a wife. Someone whose grandmother or grandfather is stricken with Alzheimer’s. Is your family emotionally drained as a loved one gradually slips away from you because he or she is gravely ill? You are not alone. Truly. Or the single parent trying so hard to raise three kids? The family torn apart by argument and strife? You are not alone. Believe me. No one is alone. We are not alone. We have Christ’s promise of God’s enduring presence, of His enduring love. That promise is made good – daily – in the Body and Blood of Christ that is the Eucharist. And it is fulfilled as well in the Body of Christ that is the Church – all of us, living in communion, becoming the eyes, the hands, the feet of our brother, Jesus Christ, for the sake of our brothers and sisters in this world.